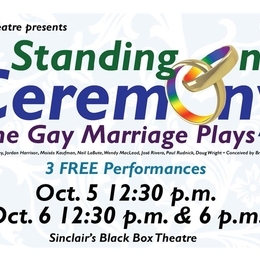 Sinclair Theatre will present 3 FREE performances of Standing on Ceremony, The Gay Marriage Plays, on October 5-6, in Sinclair’s Black Box Theatre, fourth floor, Building 2, on the downtown Dayton campus. Directed by Nelson Sheeley “Ceremony” is a series of vignettes by Mo Gaffney, Jordan Harrison, Moisés Kaufman, Neil LaBute, Wendy MacLeod, José Rivera, Paul Rudnick, Doug Wright, and conceived by Brian Shnipper. Cast includes: Spencer Boden, André Tomlinson, Marley Judd, Chelsey Hall, Erin Waldon, Raiden Otto, Courtney Kakac, Sara Eldred, Erin McGee, Cody Nelson, De’Shawn Christian, S. Francis Livisay, Naman Clark, Sha-Lamar Davis, Chelsey Hall, Elisha Chamberlin, Elisa Fuentes, Chuck Larkowski, Juan Gabriel Encarnacion, and Jess MaGill. Seating will be first come, first served with performances at 12:30 p.m. on both Wednesday and Thursday (Oct. 5-6) followed by a 6 p.m. on Thursday, Oct. 6. Sinclair’s Black Box Theatre is on the fourth floor of Building 2. Performance length is approximately 1 hour. Latecomers will not be admitted.